MSS SP75 WPHY 60 Pipe Fittings are used in many ways such as distillers, construction industries, cement, mills, pumps, and others. The product is fabricated using top-notch quality raw material and therefore they are highly durable, perfectly finished as well as robustly constructed. They are available in the variety of shapes and size and according to clients needs. The fittings would be killed steels prepared either electric furnace process or open hearth, oxygen. It makes of slabs, billets, foreign quality bar, fusion welded pipes, plate, blooms and seamless. 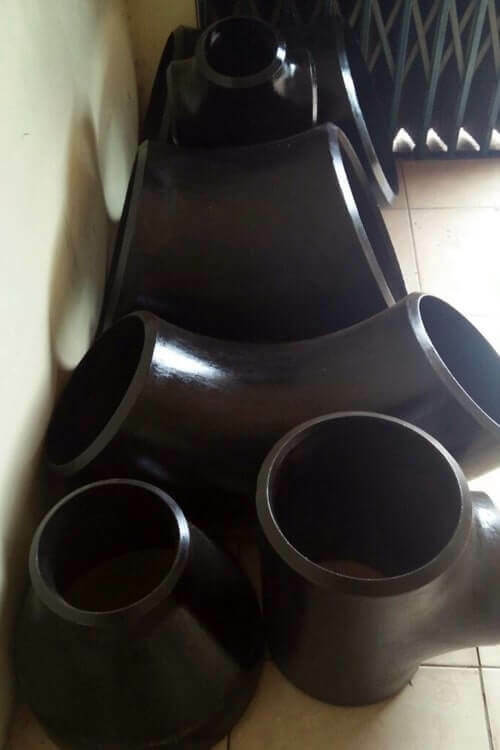 The welding pipe is built up according to the section ASME and IX pressure vessel, and boiler regarding API and ASTM specifications. Then, post welded treatment is taken according to the needs of pressure vessel code, section VIII and ASME boiler's division 1. The bevels completed of the fittings and would be furnished in accordance with different wall thickness. These fitting are readily constructed by pressing, welding, rolling, piercing, hammering, forging, upsetting and the mixture of these methods. Accomplished would be free of strains defect as well as welding repair. Grinding and machining of surface defects would be needed by some customers. MSS SP75 WPHY 60 Pipe Fittings would be then furnished in the presence of heat treated situation. The fittings have formed hot surface would be cooled under the less temperature before heat treatment. Fittings would be heat treated by using more than two methods such as- normalizing, stress relieving, tempering, quenching as well as normalizing. This is a heat treatment that is given to these fitting while making. Carbon Steel MSS-SP-75 WPHY 60 Concentric Reducer, Carbon Steel MSS-SP-75 WPHY 60 90° Short Radius Elbow, MSS SP75 WPHY 60 45° Elbow, MSS SP75 WPHY 60 Pipe End Cap Manufactures in Mumbai India, MSS SP75 WPHY 60 High Yield Reducing Tee, MSS SP75 WPHY 60 Carbon Steel Eccentric Reducer Exporter, Standard Size MSS SP75 WPHY 60 Fittings Supplier, MSS SP75 WPHY 60 High Yield CS Equal Tee, High Yield MSS-SP-75 WPHY 60 Buttweld Cross Fitting, MSS-SP-75 Gr WPHY 60 Stub Ends, MSS SP75 Grade WPHY 60 180 Deg Long Radius Elbow. Size 1/8" NB TO 48" NB..